Hot spring is one of my most fave place to chilax (chill and relax) on the planet. When I found out about Onsen – Japanese traditional hot spring in some articles long time ago, I definitely sold. So, when I visited Tokyo, going to Onsen was one of my ultimate goal. I had to do it! No matter what! Onsen comes in many types, from the minerals dissolved in the water, indoor or outdoor, separated gender or mixed. Whatever type of Onsen you choose, you required to be naked to enjoy it – like completely naked. Aww! That’s why many people get to think twice to do it. But not me! Hahaha, not that I’m an exhibitionist, but as long as it is done in separated gender, I have no problem with that. For me, this is the unique point of Onsen. Believe me, it is not as embarrassing or awkward as you think of. 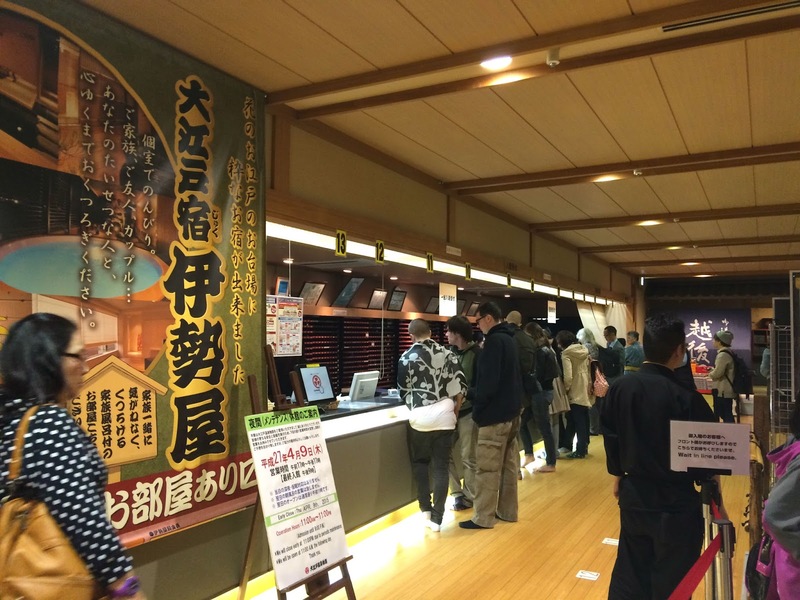 There are a lot of Onsen around Tokyo. I opted for Oedo Onsen Monogatari. Because I also wanted to visit some places in Odaiba, and the location of Oedo Onsen seems fit to my itinerary. 1. Take off shoes and put it in a provided locker in the left side. 2. Heading to registration table, the registration woman will give a light explanation about Onsen and the area while handed over the floor map, a how-to-wear Yukata brochure, a key locker and also a tag that could be use to buy any food or drinks. All the transaction will be recorded to the chip that attached in a given tag. The payment of Onsen and all the stuff that you buy in the area will be paid after you finish having the Onsen. 3. Before going inside, you have to pick which Yukata printed model you want to use. 4. Go inside, and you will be in a big changing room full of lockers, find a locker number that match to the locker key that given to you. 5. Take off all your clothes, except the underwear, and donned the Yukata. How to wear the Yukata will be explained in a brochure that given in the registration desk. 6. And then you can heading to amusement area with the Yukata, there will be a food court and game stalls where both man and woman can have some meal or games together in here. 7. If you are ready to soak, you can continue to dressing room in ladies only section. Here you will be given 1 big towel and 1 small towel. Take off your Yukata and be completely naked. You only allowed to bring the small towel to Onsen area. 8. Before immersing your body in to Onsen, please be noted that you have to rinse off first in the provided bathing section near the hot spring. And after that you can freely enjoy which onsen we want to dipped in. 9. If you finished, you can take a bath again and go to locker room, wearing back your Yukata then check out. It might be a bit confusing because they don’t really have english direction, but you can just follow what people do around you, and where they go. Or just simply ask to them directly, if they are Japanese, I bet they’d be happy to help you. I like this place – very convenient, though I wanted the more traditional and natural one. But as for first time, this was totally a good an unique experience to me. I dare you to try it! !